Combine all the dry ingredients in a large bowl (oats, quinoa, protein powder, nuts and seeds). In another bowl stir all the wet ingredients (apple sauce, olive oil, egg whites). Mix your wet ingredients with the dry ones. Stir until well blended. Spread your mixture on a baking tray and place in the oven. 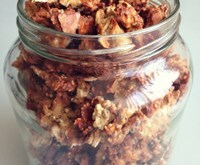 Bake the granola for about 20 minutes. Stir well and bake for another 20 – 25 minutes. Note: This tastes amazing so it's easy to go a bit overboard in eating it. Remember not to exceed the required portion which is 30 grams for one serving.